I'm kind of a sucker for Sangria on a menu. Perhaps it brings back memories of our trip to Spain with the Kids a few years ago, or maybe it's just because it's so delicious on a warm day. 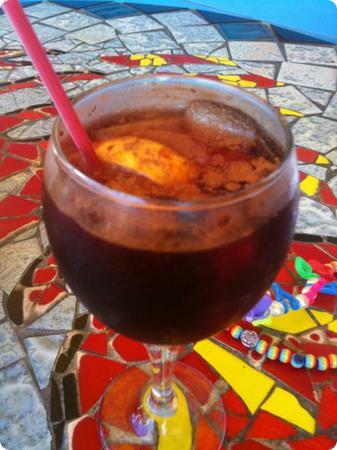 It feels like I've ordered Sangria in restaurants around the world, and I've seen lots and lots of creative variations. Still, I was surprised to see this glass show up sprinkled with Cinnamon (it was delicious). I'm wondering whether this is a regional idea in Florida? Or just something cooked up by the chefs at Frency's Beach Cafe? Has anyone else ever had Sangria with Cinnamon on top? Stephanie @ Where in the World Am I? on October 27, 2011 at 5:38 p.m. I love sangria! I order it whenever I see it. We also make it often. Whenever we open a bottle of wine that's not quite right, we save it for making sangria. Elizabeth (dim sum diary) on October 27, 2011 at 5:39 p.m. I've never had Sangria with cinnamon on top but it looks wonderful! Lisa on October 27, 2011 at 6:55 p.m.
No, I've never seen it served like that but I love cinnamon so I certainly wouldn't object! walkingon travels on October 27, 2011 at 10:04 p.m.
Laurel on October 28, 2011 at 12:12 a.m. I love sangria but have never tried it with cinnamon, will have to sprinkle some cinnamon on my next one. Sweet on October 28, 2011 at 3:30 a.m.
Kerry Dexter on October 28, 2011 at 4:16 a.m.
great the way the tones in the sangria echo the colors in the background -- lovely shot, thanks. Mara on October 28, 2011 at 4:28 a.m. I would never think to sprinkle cinnamon on sangria. The most original and delicious drink I had recently had rose water liqueur and rose petals mixed with champagne. Super yum! Sonja on October 28, 2011 at 1:49 p.m. If my daughter were drinking age, that'd be the drink for her - she's a cinnamon freak and puts it on everything! Michael Figueiredo on October 28, 2011 at 4:22 p.m. I absolutely LOVE sangria! Beautiful, colorful photo!